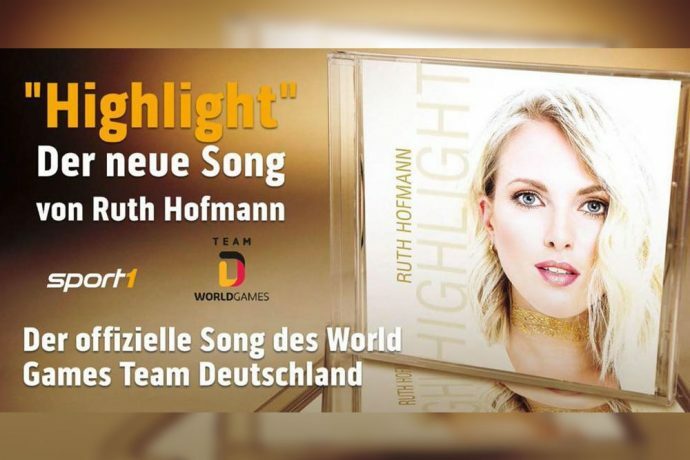 German presenter Ruth Hofmann releases her new single "Highlight"
German sports presenter Ruth Hofmann has released her second single showcasing her singing talent. The song called “Highlight” will be the official song of the German delegation taking part in The World Games 2017 (in Wroclaw, Poland from July 20–30, 2017) and the title song for the World Games broadcast on German TV channel SPORT1. The 31 year old Ausburg born sports journalist is a very familiar face to German sports fans. Hofmann started her career at Sky Sport and Sky Sport News HD, before joining SPORT1 in 2016. She is a regular host and presenter of various programmes such as Bundesliga and Premier League shows on SPORT1. But Hofmann had always a great passion for music and even wrote her own songs during her school time. She had always the desire to present her songs to the public and her dream came true earlier this year with the release of her wonderful debut single “Curiosity” (+ iTunes Download | + Amazon Download). “Highlight” is her second single and is likely to be another earworm. The song is available for download on Amazon, iTunes and Google Play.